The UNSC Vulture, also known as the AC-220 Gunship, is a heavy gunship used by the United Nations Space Command during the early years of the Human-Covenant War. The premier aerial combat vehicle for extended air-to-ground battles, the Vulture was originally produced to combat the rebel threat during the early years of the Insurrection. 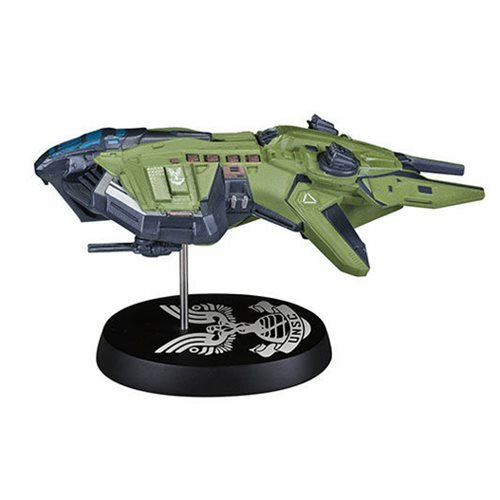 The Vulture is heavily featured in the hit game Halo Wars 2, and now you can own this beautifully detailed polyresin, limited edition 6-inch replica. Includes display base. Limited edition of 2,000. Ages 15 and up.